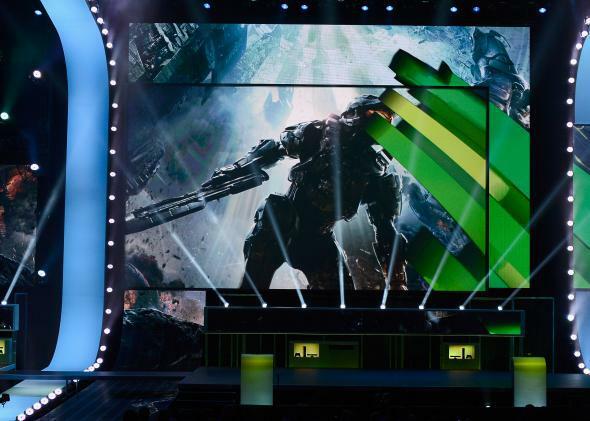 Halo—the brand burned into Microsoft’s marketing. Microsoft is uniquely terrible at naming its products. Its competitors are often playful, marketing programs with sobriquets that emphasize youthful wonder and delight: Apple sends versions of its OS X operating system into the world with the names of the animals you probably loved as a child—jaguars, snow leopards, and mountain lions, oh my! Google, meanwhile, titles many of its products after the foods you probably loved when you were young—cupcakes, jelly beans, and lollipops. Those early associations reverberate forward in time, inviting us to look fondly on commodities we have not yet tested. By contrast, Microsoft has never quite figured out a naming system for its flagship Windows OS, sometimes employing version numbers, sometimes years, sometimes suggestive words, but rarely remaining consistent for long. Most recently, it skipped straight from Windows 8 to Windows 10, a leap that apparently has more to do with shortcuts in antiquated code libraries than it does with marketing savvy. It is unsurprising, then, that as Microsoft prepares to do away with the long-loathed Internet Explorer, the company is replacing it with another goofily named—or, at any rate, code named—program, Project Spartan. Microsoft claims that it is market testing a variety of names for the new browser, but even the temporary moniker “Spartan” reveals a great deal about the way the company understands itself and its position in the marketplace. You might be forgiven for thinking the choice of “Spartan” was a nod to classical civilization, to the spare, stolid, and strong warrior princes of the Peloponnese. You might even be excused for interpreting it more narrowly, taking it as a reference to Leonidas’ cohort of 300 soldiers who fought and fell against the Persians at Thermopylae. But in fact, the name alludes to something much more recent: Microsoft’s own best-selling Halo franchise. In the Halo universe, Spartans are a class of cybernetic supersoldiers, humans fused with machines to better combat the menace posed by a variety of warlike alien races. The player takes the role of one such hero throughout large portions of the series, often singlehandedly turning the tide of intergalactic conflict. Facing a slow but steady decline of its once massive share of browser usage, Microsoft may need just such a hero. In much the same manner that the Spartans represent the best their people have to offer, Halo remains symbolically significant for Microsoft. The franchise has been central to the success of its Xbox consoles, serving as a key anchor across three generations of hardware. Indeed, Halo has been so important that Microsoft produced an installation of the series for its floundering mobile platforms in the hopes that it would inspire users to abandon their iPads and Droids for Surface tablets and Windows Phones (a plan that seems to have met with little success). Project Spartan is no game for Microsoft, but in alluding to its gaming franchise, the company seeks to light up its new offerings with an aura of symbolic success. This isn’t the first time the marketing department has gone to the Halo well. Cortana, the company’s Siri-like personal assistant, is named for the weirdly sexualized A.I. companion who accompanies the Spartan protagonist of most of the franchise’s entries. Microsoft borrowed the name of this helpful and attentive fictional character in order to imbue its real software with prefabricated personality, trading on earlier positive associations as it struggled to build new ones. By temporarily naming its new browser Spartan, Microsoft isn’t aiming at the mass audience that plays games like Halo, but at the smaller one that pays enough attention to such games to catch the reference. This is a demographic that likely overlaps substantially with the one that loathes Internet Explorer, a demographic that, in its own turn, probably encompasses many of the tech journalists who will write about the new browser. We know you hated Internet Explorer, Microsoft is saying. We hated it too. But maybe you’ll like this thing we named after something you did like? Of course, Spartan is just a code name, and code names rarely stick for long in the tech world. Given the company’s history, they will, no doubt, end up retitling the program Microsoft Web Tools or something equally stiff. And maybe that’s for the best. After all, Project Spartan’s namesakes—both in classical antiquity and in Halo’s fantastical future—meet grim ends at the close of their respective tales. In the meantime, though, Microsoft is sending a message to whoever might be paying attention: Like those outnumbered heroes, this once proud empire intends to go down fighting.